For the first time in a long while I've been feeling quite anxious and overwhelmed with things going on in my life. I've always been one to deal with stress quite well but as my plate has been getting fuller and fuller, I've been finding it hard to not feel the pressure. I can't seem to sit still without thinking I should be doing something- my mind of constantly thinking of one thing to the next. Don't get me wrong I love keeping my mind active and working on different things but knowing when to step back and take a moment to yourself is so important. Here are some ways that can help take the pressure off, when things get too much! This is really hard as I literally put myself through my paces from the moment I wake up but I'm forcing myself to take a few minutes in the morning and just breath. I've stopped checking my phone messages constantly and just let my mind and body unwind in the morning and evenings. I also really enjoy working out as it clears my head and makes me feel good. I was ill a few days ago and I had some many things I wanted to do but if your body is suffering so will your mind. I couldn't think clearly and my thoughts were all muddled, I knew I wouldn't be able to focus on anything so I forced myself to rest! Don't feel guilty if you're sitting still or having a long nap. When I felt better I was able to work through my tasks efficiently with a clearer head. I'm guilty of this one as I always like to push myself is every way I can - physically and mentally. I work out even though I sometimes have no motivation, I work on projects late at night and say yes to invites even though I should have an early night. If you know at the back of your mind it's too much then just stop, knowing your limits is not a bad thing - just be real with yourself. You will thank yourself in the long run. 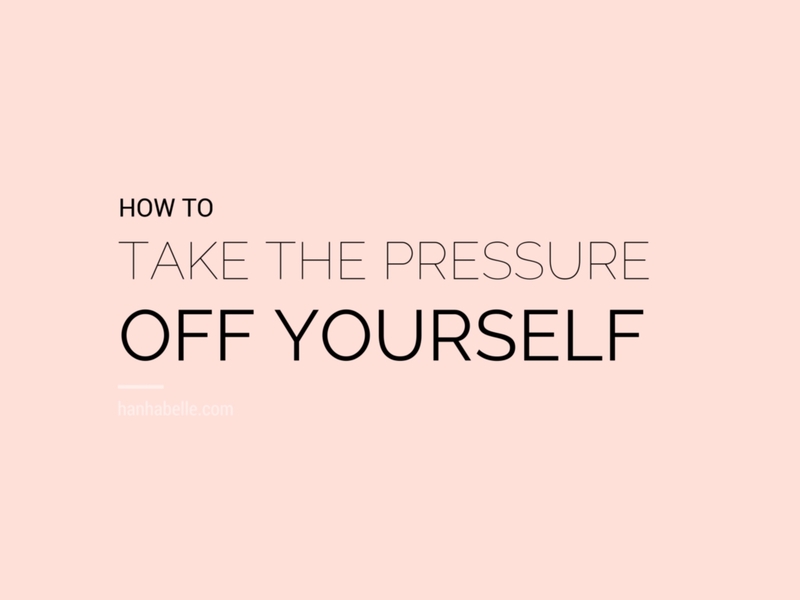 How do you take the pressure off yourself? Great article. I know that I'm harder on myself than anyone else ever was. I need to ease up. I am guilty of putting too much pressure on myself, but this has really helped me to step back and reconsider all I do! Loved it. Some really great tips, I'm constantly giving myself a hard time - especially now it's exams. I just really can't wait till it's the holidays and I can properly chill out. Really useful, sensible advice - yet I'm typing this as I plan blog posts and schedule some tweets for the week! I think everyone (bloggers especially) find it difficult to create a no-internet, peaceful space for unwinding, but it's one of my goals for the future! Great post! I definitely need to start doing some of this! Life really is too short! Stress was what originally got me into my love for fitness, definitely agree it is the best stress reliever. This post is so timely for me! I've recently started meditating for 5 minutes shortly after I wake up... makes a HUGE difference!